The secrets of a true artist are more about years of honing skill than anything else. How does this Canadian glass artist capture the intricate parts of a tiny jelly fish inside this glass pendant? You will be amazed at the detail of this unusual and one-of-a-kind work of wearable art. Pendant is approximately 1 3/4" long x 1/2" wide and is suspended from a 18" sterling silver chain. 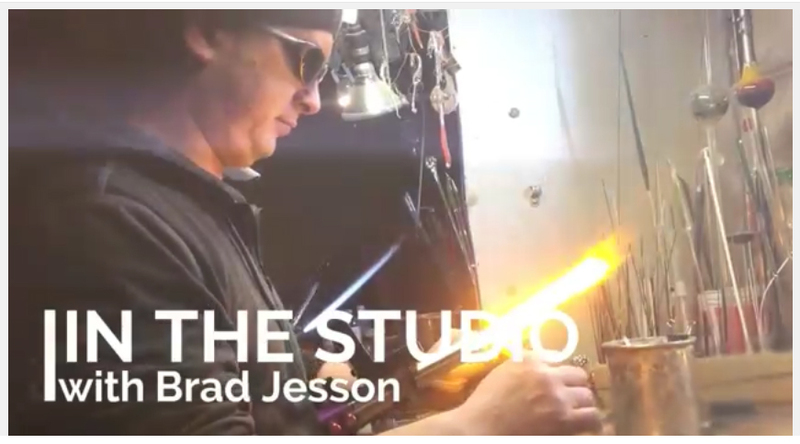 The Artist: Brad Jesson is a flameworker who thrives on the creativity and spontaneity of working with melting glass. He creates a wide variety of both functional and non-functional glass art objects, including marbles, vases, pendants, and sculptures. His art pieces are intricate and continually pushing the boundaries of what can be done with his medium. This pendant is a tiny, special example of the talent of this glass artist. Watch Brad Jesson as he creates a one-of-a-kind pendant for Cedar Lake.